Video streaming services have grown rapidly during 2018 and the third quarter of 2018 is no exception. This in turn leads to a significant increase in the combined household spend on TV services. 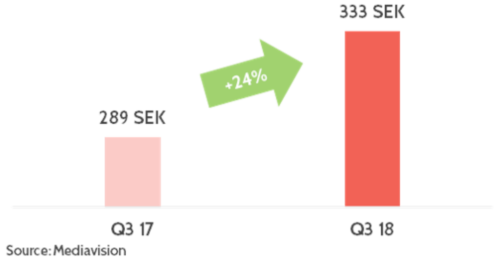 Mediavision concludes in its Q3 analysis of the Swedish video market that the monthly spend on paid subscription services has increased by 24 percent compared to last year. Consumers appetite for video streaming is high. During the third quarter of this year a majority (51 percent) of Swedish households subscribe to at least one streaming service, a yearly growth of almost 30 percent. Netflix is the main driver, adding 400,000 Swedish households over the last 12 months. But other services such as HBO Nordic, Viaplay and Cmore have also grown substantially. Newcomer YouTube Premium now equals Amazon Prime and DPlay in number of subscribing households. The same goes for transactional video on demand (TVOD) services, such as SF Anytime, that are also growing at a rapid rate. One in four Swedish households uses a TVOD service an average month. The growth of the streaming market boosts household spend. During the third quarter of 2018 households spent more than 330 SEK (~$36) on average per month on video. Part of the explanation for the growth in household video spend, lies in households retaining their traditional TV subscriptions while adding streaming services. It is, however, streaming services that drive growth. Household spend on so-called SVOD services has increased by almost 50 percent over the last year. The result is a significant increase of total household video spend, which has grown by 24 percent compared to Q3 last year.